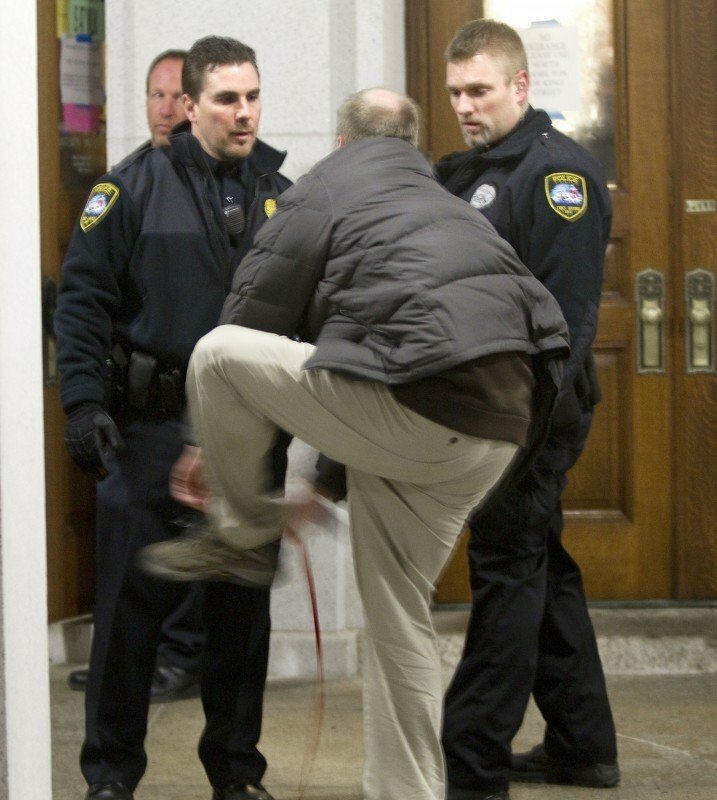 Rep. Nick Milroy (D-South Range) puts his shoe back on after being tackled by law enforcement officers as he tried to enter the Capitol Thursday night. Rep. Nick Milroy (D-South Range), right, was trying to retrieve some clothes from his office in the Capitol Thursday night when he was tackled by law enforcement officers. He is shown here after the fracas. A Democratic lawmaker tackled by police as he tried to enter the Wisconsin state Capitol when it was under lockdown said Friday both he and the officer who took him to the ground were acting too aggressively. "There was no harm, no foul in this incident," said Rep. Nick Milroy of South Range, in northwestern Wisconsin. "It may have looked violent on the video but I had a puffy jacket on." Video from WISN-TV shows Milroy struggling with officers from the Two Rivers police department as he tried to enter the Capitol on Thursday night sometime after 6 p.m., when the building was closed to the public. 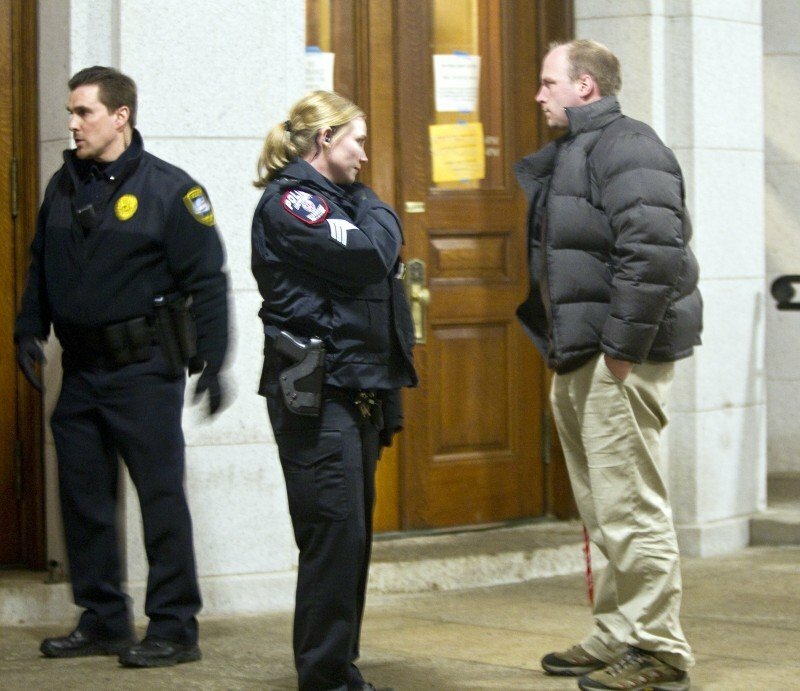 At the same time, unbeknownst to Milroy, police were trying to urge about 100 protesters who had been in the rotunda for more than two weeks to comply with a court order to leave. Protesters have converged on the Capitol in opposition to Gov. Scott Walker's proposal taking away most collective bargaining rights from most public workers. Milroy said he identified himself as a state representative and showed identification but the officers refused to let him in. He was tackled as he tried to enter despite their refusal. "I wasn't putting anybody to a test," Milroy said. "It's been a long couple of weeks for law enforcement officers, it's been a long couple of weeks for me." But Walker's Department of Administration Secretary Mike Huebsch accused Milroy of "using his own political agenda to try and get arrested." Capitol Police Chief Charles Tubbs said he had spoken with the Two Rivers chief and was expecting more information about the incident to be released later. Milroy was one of four Democrats who moved their office furniture outside on Wednesday— in part to protest the decision by Walker's administration to limit access to the building. A judge ruled Thursday night that the limitations on building access were unconstitutional, but also ordered that those protesters who had been spending the night in the building after normal operating hours had to leave. That group of about 50 left peacefully later Thursday night. Milroy said he eventually gained access to the building and praised police for how they handled the situation.